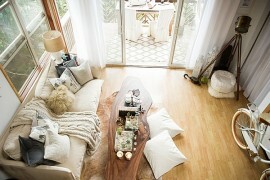 When it comes to picking out a color for the living room, we often tend to opt for the neutrals. 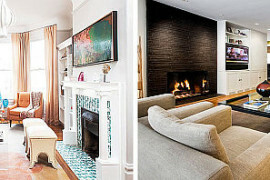 Most modern homes simply use a backdrop in white, gray, beige or even light cream and then add different layers of decor and accessories to usher in brighter hues. But for those looking to go down a different path, green offers that perfect blend between understated class and vibrant beauty. 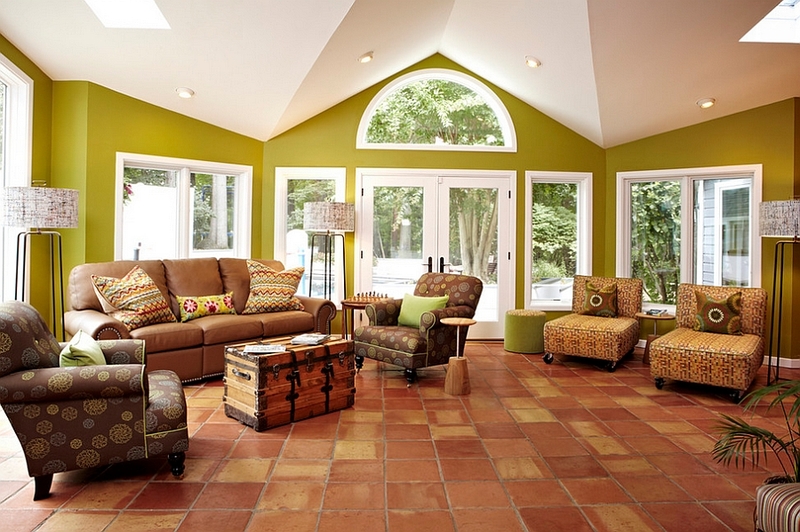 Instead of just using a few accents of green, embrace the refreshing and natural brilliance of the color this fall and winter as you start prepping your home for the holiday season ahead. 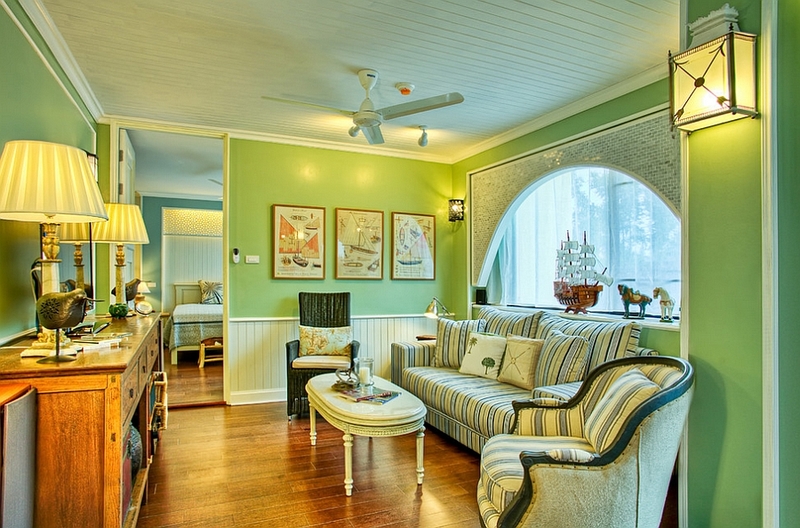 Adopting green in the living room is all about choosing the right shade for the theme and style of your home. 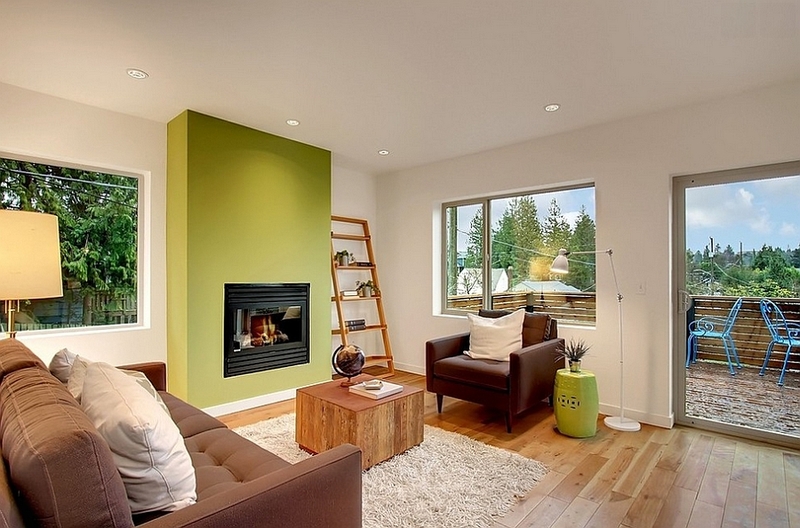 Those seeking to create a cozy, warm and elegant space would do well by picking a lighter shade of green that can be used in a more extensive fashion. 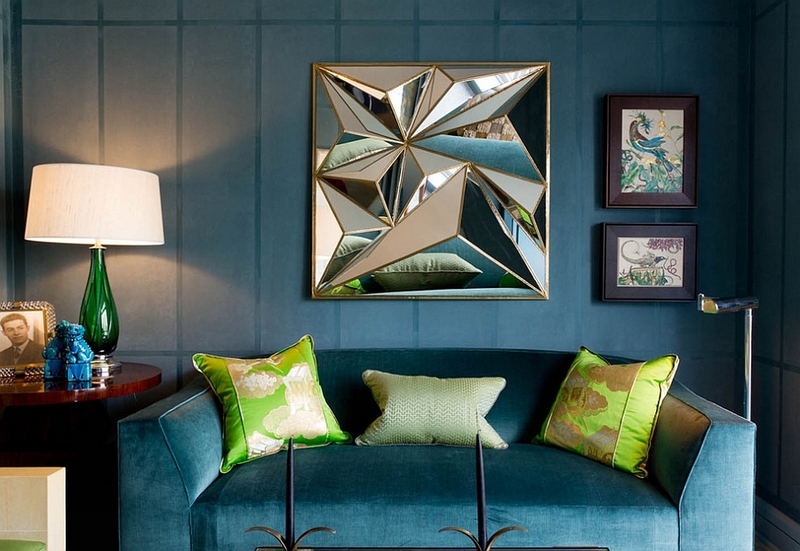 While dark shades of green such as emerald can become a touch overwhelming, gorgeous lighting and matching decor can create a sense of opulence that is simply unmatched. Sage green, olive and other beautiful shades help in striking that perfect balance between elegance and eye-catching radiance! 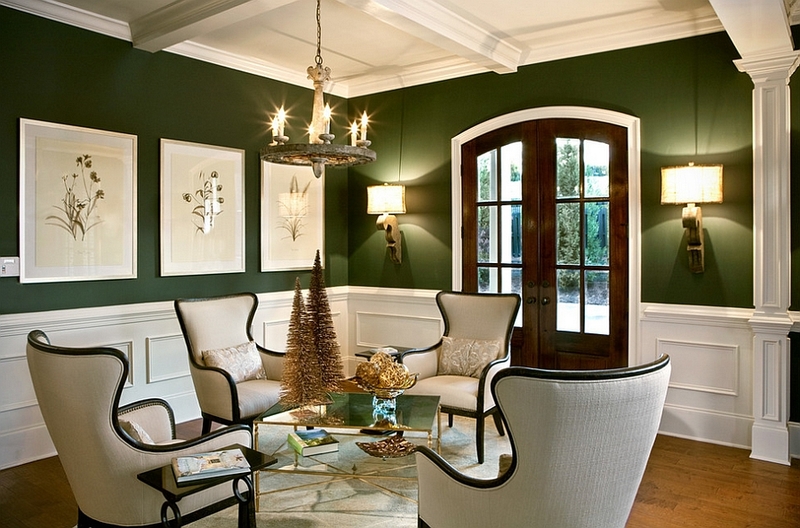 As a rule try adding a deeper and rich shade of green to a small room that is already dark and sophisticated in its appeal. 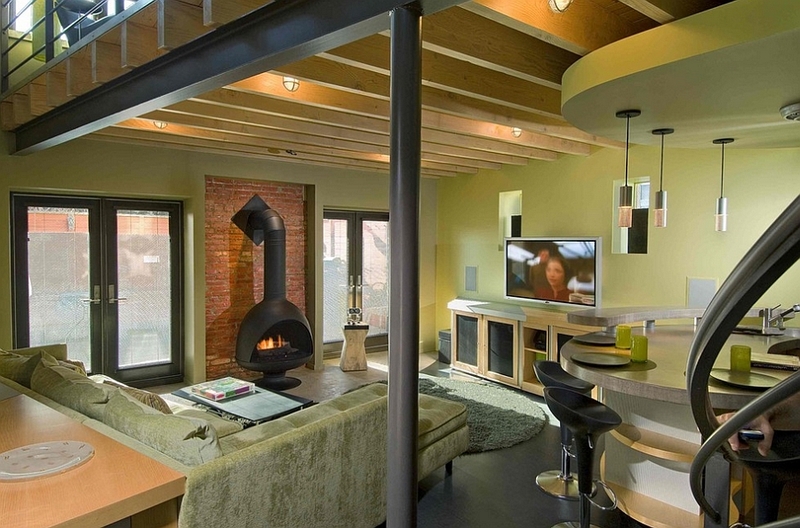 Larger living rooms with high ceilings and an open floor plan look beautiful with walls painted in lighters tones of the color. 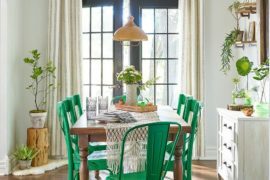 Use greens that are far too bright and glossy in a retrained fashion as they can overpower the other features of the room and seem too gaudy when used excessively. 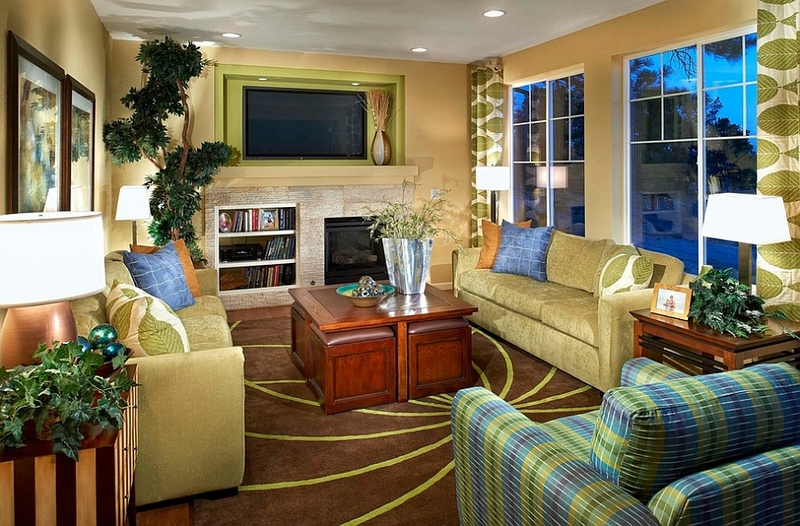 Living rooms in yellow and green are incredibly popular, and each color seems to bring the very best out of the other. 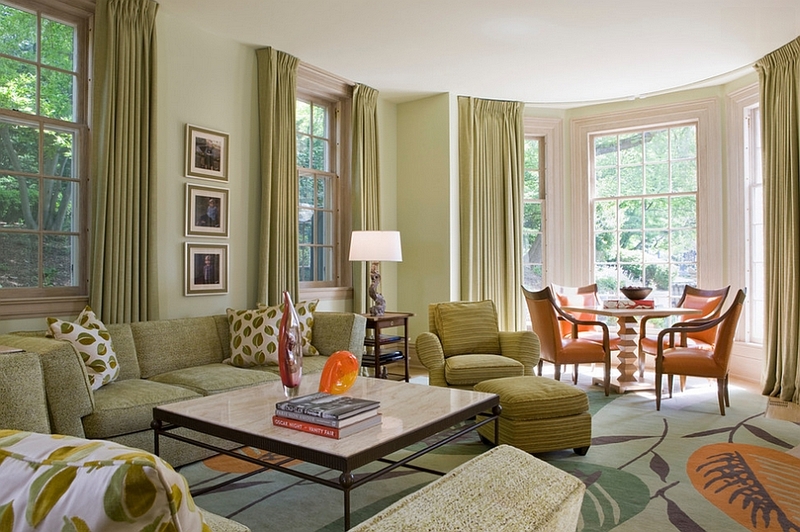 In fact, many shades of yellow and green overlap to create a beautiful visual effect that blurs the lines between both colors. When using yellow with green, the popular trend is to use a mellow yellow shade for the backdrop and a vivacious green as a secondary hue. 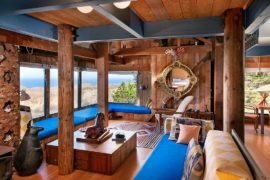 This color palette never seems to fail and delivers an enchanting interior that looks even more alluring during fall and winter months. 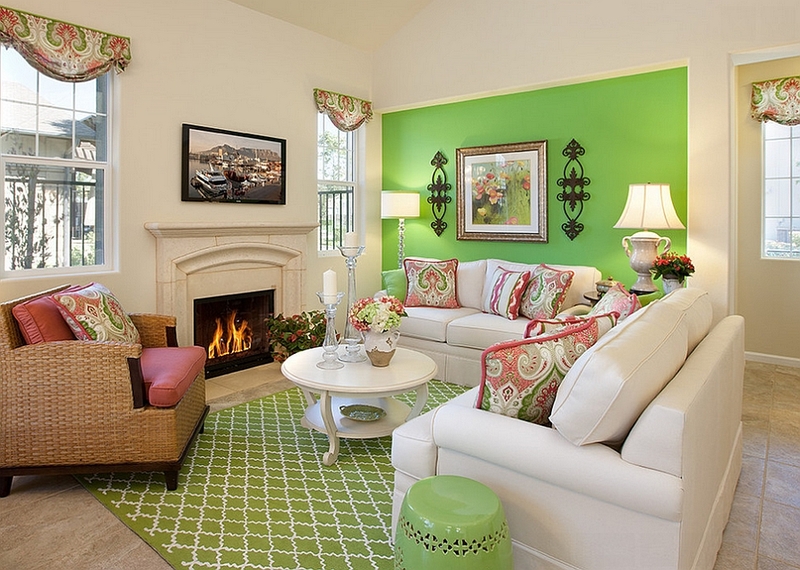 Cheerful, fashionable and easy to work with, a green and yellow color scheme has endless possibilities! 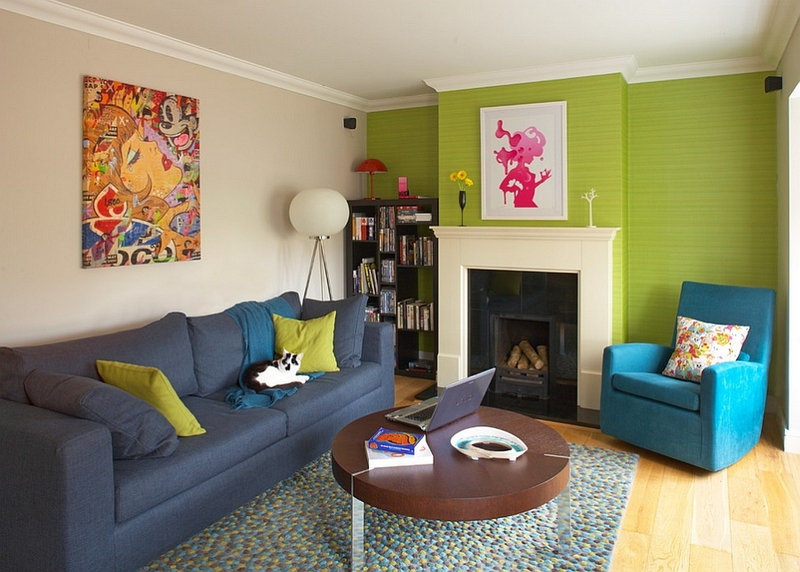 Lighter shades of green and blue also blend marvelously and help in designing a breezy and contemporary living room that has a pleasant ambiance. 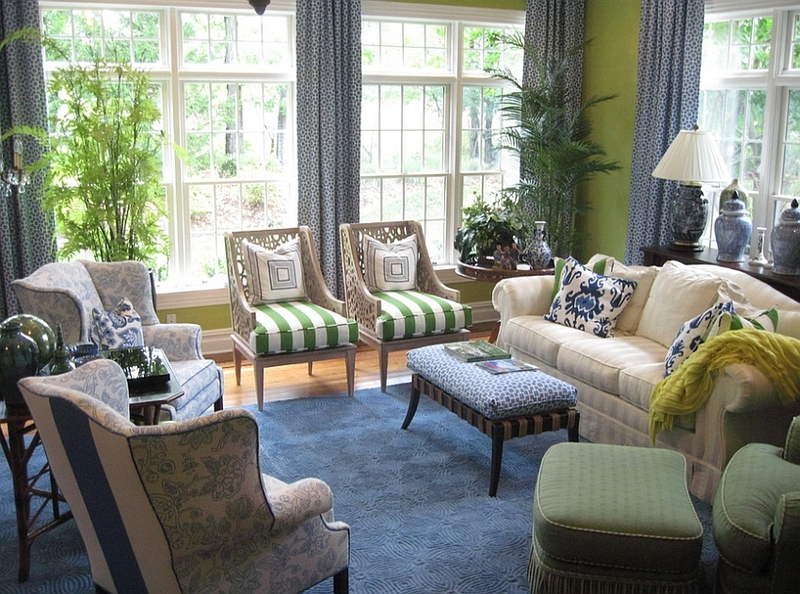 While the yellow and green combination creates a warmer, more intimate appeal, the blue and green mix brings home the breezy delights of summer! It was not too long ago that people were running away from wallpaper and adding it to your room was almost considered a ‘design sin’. 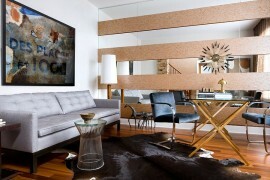 How quickly that tide has turned, with designers once again turning to wallpaper for texture, pattern and contrast! 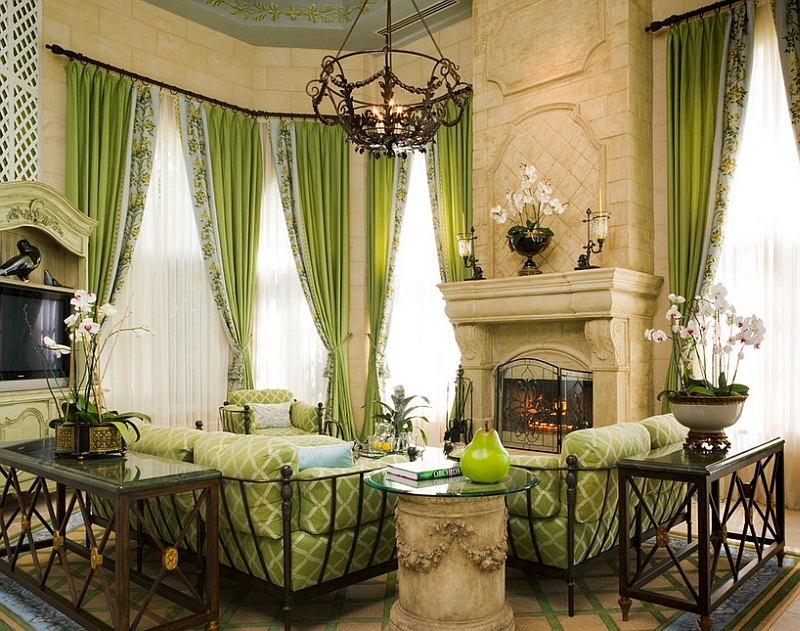 If you are not sure about painting the living room walls green, then start off by using wallpaper in a similar shade. 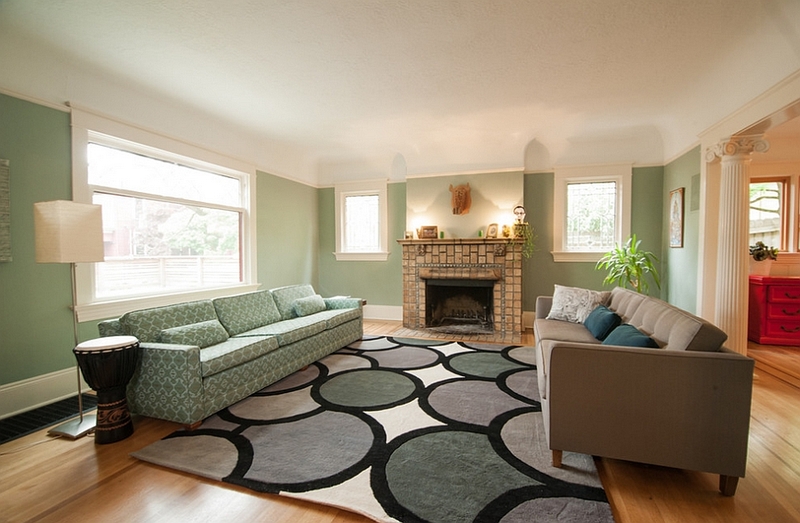 You can pick one with an intricate pattern to add a different dimension to the room. 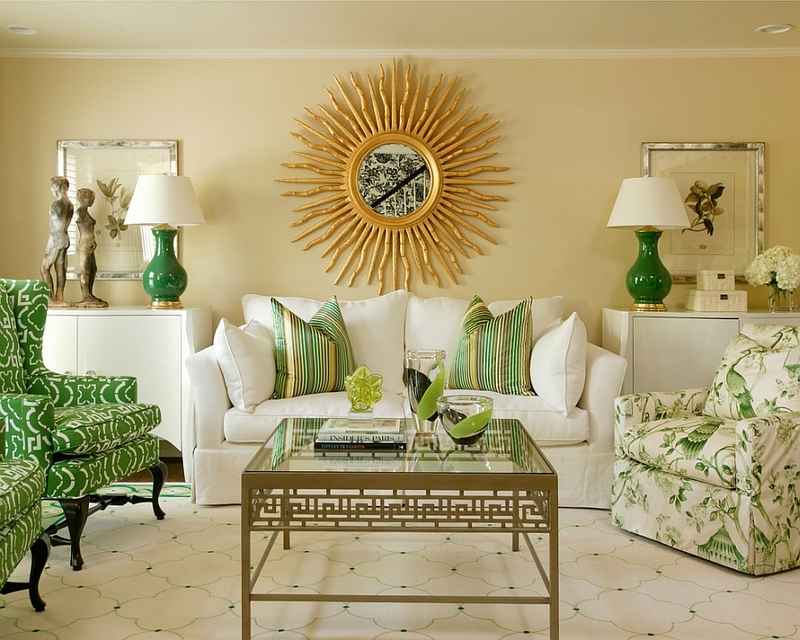 Grasscloth wallcoverings are also great in this regard, and they instantly elevate the appeal of your accent wall in green. Once you are happy with the look, you can commit to more permanent changes. Not very happy about using wallpaper? 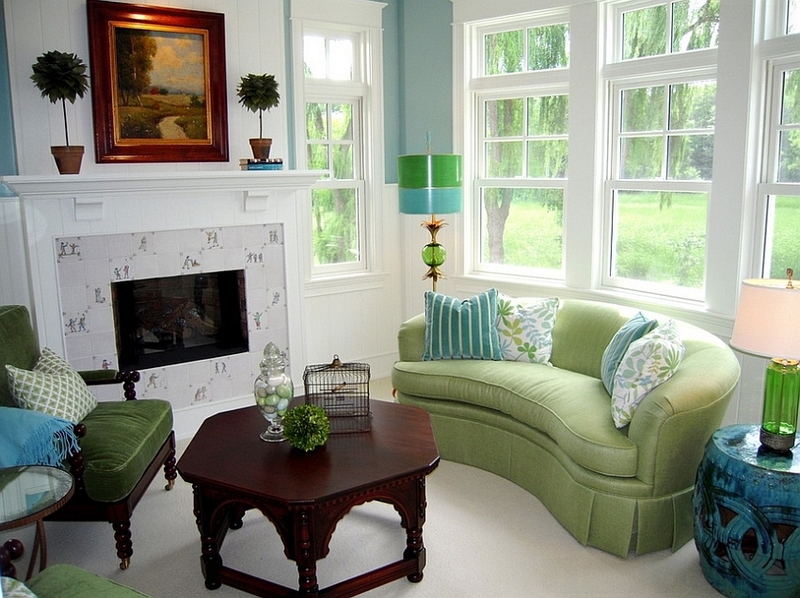 You can still give the color green a go in the living room by using throw pillows, side tables, chairs or a couch in green to see if you are happy with it. Obviously some of these can easily be switched out in case you want to turn toward another trendy color in the months ahead. 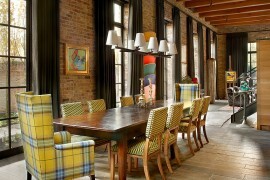 Drapes are also a wonderful way of adding color to the living room without actually making huge changes. 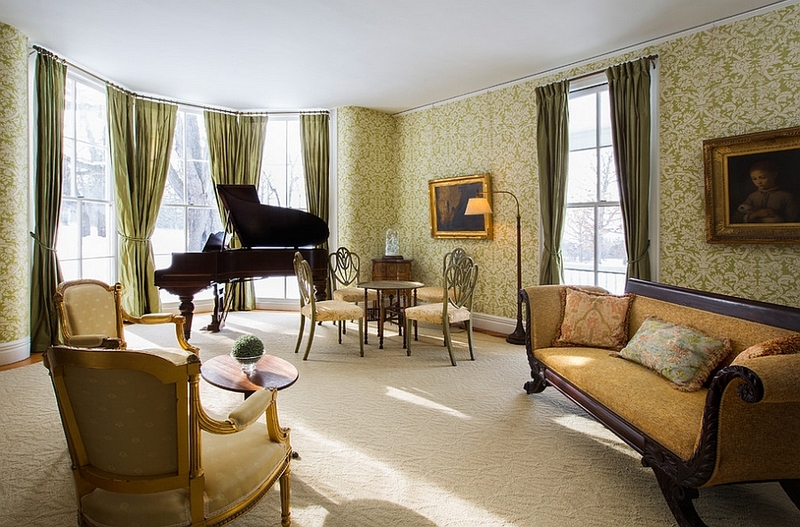 Despite having white walls, green drapes coupled with the right decor can instantly alter the entire ambiance of the room. And with the holiday season around the corner, they seem even more apt!